JOLIET, IL—(Marketwired – Dec 8, 2014) – Any good relationship involves a fair amount of give and take, whether it's between two people or a hotel and its community. And when visitors arrive at the Fairfield Inn & Suites Joliet North/Plainfield, they can feel the effects of that happy balance. Just as the neighborhood embraces the hotel, the hotel has embraced a diverse range of local causes to support over the past year. The property enjoys a distinguished reputation among hotels in Joliet, Illinois, even without taking its philanthropy into account. The hotel's convenient location near the I–55 and Rt. 30 puts local attractions like the Chicagoland Speedway within easy access, and its value–added amenities like complimentary Internet access and daily breakfasts make it a favorite among travelers. 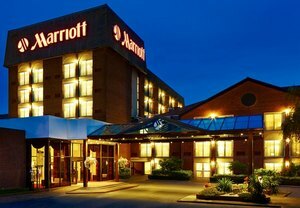 Such competitive advantages also make the property a natural leader among Joliet, IL hotels. It's no surprise, then, that the community has repeatedly looked to it for help. In 2014, the property donated free room nights to no fewer than nine different causes. The beneficiaries of the hotel's generosity range from local residents like Barb Kagay, who is battling Stage 3 breast cancer and needs help covering medical bills, to national organizations like the March of Dimes, which funds research for premature birth defects. Other causes supported by the hotel include the Cub Scouts, the Shorewood Kiwanis Club (which raised money to benefit the Provena Saint Joseph Medical Center), the Provena Saint Joseph Pediatric Center of Excellence, Lockport High School, Cruising for Logan (a car show benefitting an autistic child in need of financial assistance for medical expenses), A Change for Evan (benefitting a baby boy in need of a liver transplant) and a silent auction benefitting a local family who also needed help covering medical expenses. Whether guests experience the property's top–notch hospitality with a free night donated to a great cause, or at rates that are on par with the most competitive Joliet hotel deals around, they can look forward to a stay that is both memorable and impactful. After all, helping the community not only makes it a better place to visit; it is also, quite simply, the right thing to do. 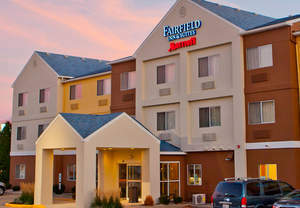 The Fairfield Inn & Suites Joliet North/Plainfield offers visitors some of the most welcoming accommodations in Joliet, IL. Guests encounter fresh and vibrant spaces around every corner, from the upbeat lobby, to the spacious guest rooms, where LCD flat–screen HD televisions, cable channels, complimentary high–speed Internet access and plush bedding ensure a productive and restful stay. Free daily breakfasts feature continental, buffet and hot options, and a fitness center with an indoor pool and whirlpool help guests stay active while on the road. Nearby attractions include Harrah's Casino, Inwood Golf Course, Route 66 Raceway and Lewis University. PARIS, FRANCE—(Marketwired – Dec 8, 2014) – While Paris is known for many things, fashion and food undoubtedly enjoy top billing. So travelers looking to experience both of these things will appreciate the Vendome Exclusive package available at the Renaissance Paris Vendome Hotel. Offering guests a taste of fine dining in Paris as well as a location just steps away from the city's best shopping, this package should be at the top of every traveler's Christmas list. Guests arriving at this 5–star boutique property will find themselves in the heart of Paris' fashion district, a fact that makes the experience of holiday shopping feel like a gift in and of itself. Visitors can stroll through the boutiques of the historic Galerie Vivienne, for example, or wander along the legendary Rue de Rivoli. Or they can simply enjoy the journey to each destination, stopping in at the numerous shops, boutiques and markets along the way. Whatever they need to find for their Christmas lists, guests booking the Vendome Exclusive package will have all the energy they need to scour the shops. That's because this package pulls back the curtain on fine dining in Paris, France. Visitors don't have to beg concierges for reservations at the best restaurants when they stay at this property. Instead, the acclaimed cuisine of Michelin–starred Chef Alain Dutournier is just downstairs from their guest rooms — and included with the package. Considering Chef Dutournier's twin accomplishments in food and wine (he is a member of the Académie du Vin de France), the package's three–course dinner and wine pairings at Le Pinxo restaurant are nothing short of gastronomic heaven. Guests can spend an evening savoring the seafood, tomatoes, peppers, mushrooms, cheeses and more that honor Chef Dutournier's origins in the South of France, even as each dish incorporates Parisian influences in the techniques and adventurous pairings. The package, which can save guests up to EUR 400 during their stay, also includes buffet breakfasts for two and a bottle of Champagne. After guests enjoy their fill of shopping and dining, they can take advantage of the fact that they're staying at one of the best spa hotels in Paris and unwind with a treatment or two. The Vendôme SPA by Asian Villa offers a full menu of treatments, from massages and manicures, to fitness counseling and foot baths. Plus the sauna, steam room, power–jet shower and daylight–infused indoor pool promise a multitude of ways to luxuriously relax. To experience the holiday season in the City of Light, guests may use the promotional code P91 when booking the Vendome Exclusive package. Rates for the package, which are available now through 10 May 2015, start at EUR 379 per night. Guests of the Renaissance Paris Vendome Hotel indulge in 5–star luxury and unparalleled access to the best of France. Not only are downtown Paris' best attractions like the Louvre and Orsay Museums nearby, but Champs–Elysees, the fashion district and Rue de Rivoli are all just steps away, too. Of course, with well–appointed guest rooms featuring plush bedding, flat–screen LCD televisions, marble bathrooms and deluxe amenities, visitors may prefer to stay in before trying the hotel's critically acclaimed Le Pinxo restaurant or sipping a handcrafted cocktail at Bar Chinois. This Paris hotel also indulges guests with a spa, fitness center and indoor pool, plus a 258–square–foot meeting room for intimate gatherings. 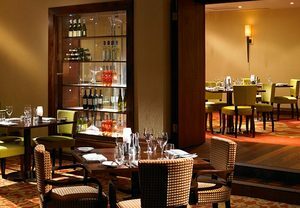 MANCHESTER, UNITED KINGDOM—(Marketwired – Dec 8, 2014) – Talk to Thomas Gardner, the new Executive Chef at The Dining Rooms at Worsley Park Marriott Hotel & Country Club, and it's clear he's passionate about food. As with most true experts, however, Gardner's passion isn't limited to his profession. Yes, he loves food — especially local produce and dishes — but he's also fascinated by geography and history. And he's bringing that enthusiastic curiosity about life in England's northwest region to bear on the menus of The Dining Rooms. Gardner's arrival at this international restaurant in Manchester heralds an exciting new chapter in its story. Already The Dining Rooms enjoys the distinction of having earned an AA Rosette Award, and its commitment to local ingredients is established. But Gardner's well–rounded approach to the new menu transcends farmers markets and produce lists to really embrace the region as comprehensively as possible. Gardner got his start in Preston, where he underwent classical culinary training before joining the Marriott 17 years ago as an apprentice. Soon after, his talent and commitment earned him the position of senior sous chef. Gardner has worked at Marriott properties throughout most of his career, while other roles, like his appearance as a guest chef at the Bolton Food Festival, have created the diversity of experience necessary for any great Executive Chef. 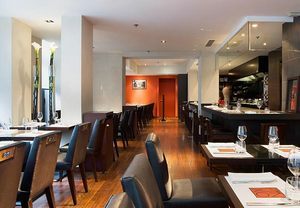 The Dining Rooms is the flagship restaurant of this premier destination among Manchester hotels. Situated on 200 acres of verdant parkland, the hotel feels like an urban retreat. Guests find themselves a mere seven miles away from the city centre in Manchester, UK, yet they can relax with golf, spa treatments, luxurious accommodations and, of course, unparalleled dining. No matter if guests arrive for a vacation or just dinner, they are bound to notice the changes Chef Gardner is implementing at The Dining Rooms. With a background as steeped in local traditions as the restaurant itself, Chef Gardner promises to return The Dining Rooms to its roots and, in so doing, watch the restaurant bloom in exciting new ways. Offering its guests a stay that is part sophistication, part seclusion, the Worsley Park Marriott Hotel & Country Club makes a distinctive choice. The four–star hotel welcomes visitors with an 18–hole championship golf course, full–service spa and exceptional leisure club, which offers cardiovascular equipment, personal trainers, fitness classes and an indoor pool. Three restaurants range from the AA Rosette–winning The Dining Rooms, to that favourite among hotel bars in Manchester, UK, The Chimney Bar & Lounge. The 158 stylish guest rooms afford views of the garden or golf course and encourage relaxation with high–speed Internet access, luxury toiletries and flat–screen televisions. Plus nine meeting rooms with 520 square metres of space facilitate unforgettable meetings and special events. NEW YORK, NY—(Marketwired – Dec 8, 2014) – China International Capital Corp. captures the top spot on the All–China Research Team, Institutional Investor's annual ranking of the nation's leading sell–side equity analysts, for a third year running. Its researchers earn at least one position — and in some cases, three — in 18 of the survey's 20 sectors. Complete results can be found at www.institutionalinvestor.com/rankings. Bank of America Merrill Lynch returns in second place even though its total falls by two, to 14. Credit Suisse climbs one level, to No. 3, but that modest rise belies the organization's robust gains: its team total nearly doubles, from six spots to 11 — a feat bested only by fellow Swiss bank UBS, whose total vaults from three to ten. The latter firm rockets from ninth place to fourth and is this year's biggest upward mover. Rounding out the top five is Morgan Stanley, which rises one rung after picking up three spots, for a total of eight. Eighteen firms are represented on this year's team, including three that didn't appear last year: Barclays, DBS Vickers Securities and SWS Research Co. Although it lands in second place overall, BofA Merrill is No. 1 in terms of sector–topping appearances. Six of its analysts are deemed the best in their respective categories: Cheong–Ga (Karl) Choi, Conglomerates; David Cui, Portfolio Strategy; Wai (Eddie) Leung, Internet; Ting Lu, Economics; Chen Luo, Consumer/Discretionary; and Xinnian (Sydney) Zhang, Telecommunications. CICC ranks second when firms are measured by this metric. Five of its researchers are No. 1 this year: Zheng Gao, Basic Materials; Bin Guan, Energy; Junhua Mao, Banks; Shengbo Tang, Insurance; and Xin Yang, Infrastructure & Transportation. 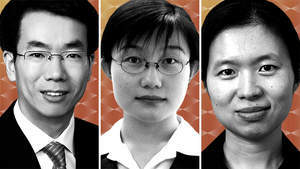 The 2014 All–China Research Team reflects the opinions of nearly 850 investment professionals at 410 institutions that manage an estimated $584 billion in Chinese equities. For more information contact Alyssa Walker at awalker@iiresearchgroup.com or (212) 224–3677. Now in its fifth decade, Institutional Investor has consistently distinguished itself among the world's foremost financial publications with groundbreaking journalism and incisive writing that provides essential intelligence for a global audience. In addition, Institutional Investor offers a host of proprietary research and rankings that serve as respected industry benchmarks. For more information visit www.institutionalinvestor.com. SLOUGH, UNITED KINGDOM—(Marketwired – Dec 8, 2014) – Visitors arriving at Heathrow Airport don't have to travel far to get into the swing of the holidays this year. That's because the Heathrow/Windsor Marriott Hotel, located just two miles away from the airport, has enough seasonal cheer to put even Santa through his paces. With festive parties, group packages, holiday meals and an action–packed calendar in the surrounding neighborhood, this hotel is making everyone's holidays both merrier and brighter. Additional must–see events include the Living Advent Calendar, which features 15–minute mystery performances at different locations in the days leading up to Christmas; and the award–winning Lapland UK experience, which immerses audiences in the legend of Father Christmas. Of course, the hotel has plenty to keep visitors and locals busy this season, too. Small groups can celebrate in a big way at the hotel's joiner party nights. For just £40 per person, small parties of eight or more can sit down together for a four–course dinner and dancing. And if anyone wants to sleep off the fun before going home, the property offers special Festive Accommodation Rates of just £55.00 single occupancy or £75.00 double occupancy, inclusive of a full English breakfast the next morning. Those who want to experience top–notch dining at Brasserie Centrale, the hotel's international restaurant in Heathrow, can book a Brasserie Festive Dinner through January 2015. In addition to tempting menus of roast turkey and sticky toffee pudding, the dinners inspire an intimate conviviality among family and friends. Party lunches are also available throughout December 2014 for groups who want to get out of the office to celebrate together. Additionally, the hotel accommodates those travellers who are on the go this season. Its Park Here, Fly There package invites adventurers to stay on property one night and leave the car at the hotel's 500–car parking lot whilst out of town. Others who are expecting family during the holidays will find affordable rates for comfortable rooms — and avoid any overcrowding at home. Making holidays happy, after all, is part of every deal at these accommodations in Windsor, UK. Getting to the Heathrow/Windsor Marriott Hotel is easy. Leaving, however, is harder to do. For while the property is just a few miles away from the airport and close to both the M4 and the M25 motorways, its attentive service, comfortable accommodations and convenient amenities make everyone want to stay. Guests enjoy a range of guest room options, including Family and Executive Rooms, all of which feature Wi–Fi access, laptop–size safes and plush, Egyptian–cotton bedding. A leisure club, indoor pool and tennis courts make it easy to indulge in the hotel's impressive international dining near Heathrow Airport. The Brasserie Centrale and Chats Café Bar all offer an exciting range of cuisine. And with 20 function rooms affording nearly 5,000 square feet of event space, the hotel makes meetings and special events unforgettable. EL PASO, TX—(Marketwired – Dec 8, 2014) – The El Paso Marriott is pleased to introduce Celia Dubrule as new General Manager of the property, welcoming her as she brings more than 20 years of experience to the new role. Dubrule is a veteran of the hospitality industry, having served under the Marriott banner for more than two decades in various positions and across multiple locations. Recently, she moved from her position as General Manager of the El Paso Courtyard Marriott to take over as the new GM for Marriott's full–service El Paso location. Dubrule began her career at the El Paso Marriott in 1990 as a Payroll Clerk, before moving to accounting in 1993 as an A/P. In 1998, she became Engineering Assistant to the Chief Engineer, and the following year, took a position as Front Desk Supervisor. In 2000 she was named Assistant Front Desk Manager and in 2001 became certified as a General Manager from select service, where she was named GM of the El Paso Courtyard Marriott. Over the years, Dubrule has proved to be an invaluable resource at the El Paso Marriott, helming a number of initiatives that have seen the property grow and evolve. Its convenient location near the El Paso International Airport makes it one of the most sought after destinations for travelers on the move, and its accommodating features including a refreshing heated indoor/outdoor pool, dining spots with a unique twist on Southwestern American cuisine, and complimentary shuttle to nearby sights, make it a must–visit. The hotel's accommodations are located just moments from El Paso Texas' gorgeous outdoor sights, like Franklin Mountains State Park, or the Huerco Tanks State Historic Site. Travelers on business can take advantage of the property's proximity to the El Paso, TX Convention Center, airport and other businesses, while those looking to get away can take a leisurely drive along Scenic Highway 28. 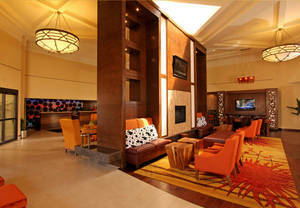 For more information about the hotel, visit the El Paso Marriott website or call 1–915–779–3300. Ideally located near the El Paso International Airport, the El Paso Marriott offers a convenient and complimentary 24–hour shuttle service, granting guests access to the best of the American Southwest. Additionally, its elegantly decorated rooms come standard with lush bedding, aromatherapy amenities, and a work space with a pull–out desk. Travelers can stay connected with 32–inch LCD TVs and adaptable plug–in panels, then fuel up for the day or enjoy a mid–day repast with lunch and dinner at the onsite Great Room. Guests looking to ease into their stay with a little relaxation can take a dip in the hotel's heated indoor/outdoor pool and sauna, or stay active at the state–of–the–art fitness center, featuring LCD TV screens on all cardio equipment for extra motivation. Of all hotels near El Paso Airport, the El Paso Marriott offers the most winning blend of friendly service and superb amenities seasoned travelers have come to expect. CHAPEL HILL, NC—(Marketwired – Dec 8, 2014) – The Courtyard Chapel Hill is celebrating the season with something special for holiday event planners who book at the Chapel Hill meeting space for the holidays. The hotel is announcing an exclusive offer that includes complimentary meeting space, valued up to $600, with new catering orders of $500 or more. The offer is exclusive of tax, service charge, and gratuity and will be available throughout the holiday season for meeting and event planners booking their holiday party, conference, or gathering at the hotel. With three flexible meeting rooms and more than 1,800 square feet of space, the Courtyard Chapel Hill can accommodate any function for the holidays, from company parties to meetings and conferences, lunches, or elaborate dinner parties. Its Old Well/Bell Tower can host up to 100 and the property's two breakout meeting rooms are perfect for smaller events. Delicious, customized menus, crafted from the hotel's talented culinary team highlight flawless celebrations. Chapel Hill offers endless things to see and do during the holiday season. 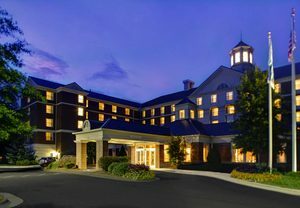 Your attendees can visit the UNC campus, go shopping or make dinner reservations at Meadowmont Village. Located near the best shopping and sights in downtown Chapel Hill, the hotel is a prime spot for ringing in the season in style and a gateway to the best of the city. It's also located just moments from the William and Ida Friday Center and easily accessible from Raleigh–Durham International Airport and Research Triangle Park. Guests and event planners looking to take advantage of this exclusive holiday offer can call the sales department at the hotel directly for more details at 919–883–3403. Or, request more information and begin booking their Chapel Hill NC event venue, by visiting the hotel website. Comfortable lodging and modern amenities await guests at the Courtyard Chapel Hill. Whether arriving for business or pleasure, the hotel offers everything travelers need to relax and re–energize. Well–appointed rooms and suites feature large work areas and wireless Internet access, and guests can take advantage of the unique media pods in every room to watch Cable stations on flat–screen TVs. Travelers are welcome to stop by The Bistro in the morning and evening for healthy cuisine, or to fuel up with a cup of hot Starbucks® coffee. The hotel also features an onsite fitness center and jogging trail, located just outside. The property offers flexible and spacious meeting and event space, including an outdoor lounge, and the hotel's largest indoor venue, the Old Well/Bell Tower, accommodating up to 100 guests. Located just moments away from downtown Chapel Hill, NC and the University of North Carolina – Chapel Hill campus, Courtyard Chapel Hill is a comforting gateway to the best the region has to offer. SHANGHAI, CHINA—(Marketwired – Dec 8, 2014) – On its fourth anniversary, The Ritz–Carlton Shanghai, Pudong in China was voted as the #1 Hotel in Asia by readers of Condé Nast Traveler in the United States. “It's the sort of place you dream of staying in.” The 5 star Shanghai hotel fills the top floors of a 58–story financial district building that is a quick walk from the iconic Oriental Pearl Tower. 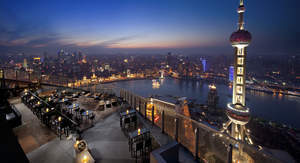 Guests have easy access to high–end shopping, and the Shanghai hotel suites — “the largest and most luxurious I've seen in China” — have views of the Huangpu River and the city's ever–evolving skyline. The lobby's dark woods and chrome are reminiscent of Shanghai's 1930s Art Deco era. In the 53rd–floor Jin Xuan, “excellently trained staff serve traditional Cantonese cuisine.” — Compliments by Condé Nast Traveler in 2014. The Condé Nast Traveler Readers' Choice Awards are the longest–running and most prestigious recognition of excellence in the travel industry and are commonly known as “the best of the best of travel.” Under Editor–in–Chief Pilar Guzmán, the Readers' Choice Awards have become more selective and specific to the passions that inspire today's travelers. The Conde Nast Traveler Readers' Choice Survey, started in 1988, is available to all readers through a secure website. This year's final tabulations are more than 76,600 for 7,721 hotels, 642 cities, 453 cruise ships and 148 islands, with an average survey time of 16.5 minutes. The result is 1,182 of the best travel experiences in the world. Organization: The online questionnaire contains lists of candidates in various categories (Cities, Hotels, etc.). Individual candidates are judged by relevant criteria for each. Those that receive a required minimum number of responses are deemed eligible for a Readers' Choice Award. Evaluation: Each candidate is rated, criterion by criterion, on a five–point scale: excellent, very good, good, fair and poor. Those scores, which represent the percentage of respondents rating a candidate excellent or very good, are averaged to determine the final score published here. The Ritz–Carlton Shanghai, Pudong opened on 21 June 2010. It is the luxury hotel brand's second hotel in the city, and it's seventh in China. Located in Shanghai IFC, the prime real estate in Lujiazui financial and entertainment center, the hotel complex is the masterpiece of world famous architect designer, Cesar Pelli. The 285–room Ritz–Carlton Shanghai, Pudong occupies the top 18 floors of the Shanghai IFC Tower I. With interior designs by Richard Farnell, style of the hotel is contemporary with hints or new interpretations of 1930's Shanghai Art Deco. This gives a great sense of place to the hotel as guest rooms and restaurants embrace magnificent sweeping views over The Bund — the most intact collection of Art Deco architecture anywhere in the world. The Ritz–Carlton Shanghai, Pudong's guest rooms and suites range in size from 50 square meters to 410 square meters. There are three floors of Club accommodations and each club room enjoys access to the hotel's stunning Club Lounge on the 49th level. The hotel also offers a variety of dining options with four Shanghai, Pudong restaurants and a bar. About The Ritz–Carlton Hotel Company, L.L.C. The Ritz–Carlton Hotel Company, L.L.C. of Chevy Chase, Md., currently operates 87 hotels in the Americas, Europe, Asia, the Middle East, Africa, and the Caribbean. The Ritz–Carlton is the only service company to have twice earned the prestigious Malcolm Baldrige National Quality Award, an award that originated in 1987. Its purpose is to promote the awareness of quality excellence, recognize quality achievements of companies and publicize successful quality strategies. The Ritz–Carlton Hotel Company won the award in 1992 and 1999. For more information, or to make a reservation, contact a travel professional, call toll free in the U.S. 1–800–241–3333 or visit the company website at www.ritzcarlton.com. The Ritz–Carlton Hotel Company, L.L.C. is a wholly–owned subsidiary of Marriott International, Inc. (NYSE: MAR). Dedicated to “Building Homes with Heart”, Sun Hung Kai Properties (SHKP) has followed a focused business strategy since it went public in Hong Kong in 1972. The company has a seasoned team of excellent management striving for business success and high standards of corporate governance. This solid foundation and leadership have made SHKP one of the largest developers in Hong Kong. Its trusted reputation for quality products and service has earned high praise from leading local and overseas professional and financial institutions. Besides its dedication in Hong Kong's premium projects, SHKP has been firmly anchored and strived for quality to develop landmark projects in mainland China. With a selective and focused investment strategy, SHKP is bringing its success and professional experience in Hong Kong to major cities, contributing to the development of mainland China. The Group owns several of Hong Kong's finest hotels, and has developed some premium hotels in both Hong Kong and mainland China, including the Ritz–Carlton Shanghai, Pudong at Shanghai IFC and another Ritz–Carlton at Hong Kong ICC.